Mini Eyelash LATEX FREE Adhesive (Dark Tone, 0.02 oz) for your strip eyelashes. Adhesive is white when liquid and dries to a black matte finish. This mini glue sets quickly and offer secure hold all day! Pair with Ardell Fashion Lashes, Andrea Modlash, Kiss Lashes, Gypsy Faux Lashes or Red Cherry False Eyelashes! 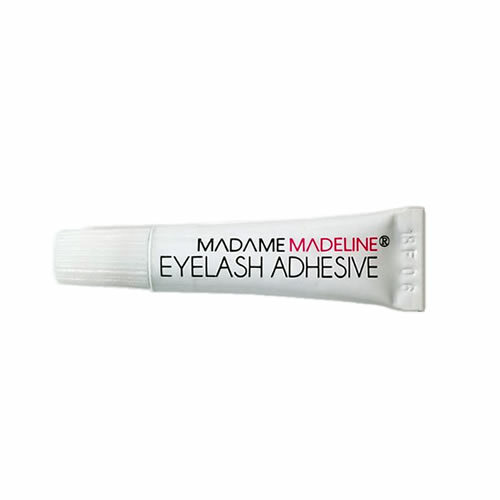 HANDS DOWN MY FAVORITE LASH GLUE! Very easy to stick on my lashes and stays on all day! It doesn't feel heavy or weigh down your eyes when you wear with falsies! Highly recommend this product! Easy to apply and easy to remove it does not damage your real lashes. I like the dark tone so it blends into my lash line much better. My purchase came quick. The glue does not show because it dries dark blends well with eyeliner. Buying more to keep in stock. I use with my strip lashes holds them all day.